Professional iOS file transfer software which can safely and easily transfer photos, contacts, etc. between iPhone/iPad/iPod and computer, also between iOS devices. As we all know, it seems extremely complicated to transfer data between iOS device and computer via iTunes. It takes so much time to sync the data with your iPhone/iPad/iPod, even the result is not as expetced. That's the reason why we develop MobieTrans which enables you to transfer any data like photos, music, videos, contacts, SMS, etc. between your iPhone/iPad/iPod and computer without iTunes, it can also transfer data between iOS devices. Key Features: 1. Transfer files Apeaksoft MobieTrans, as the best iphone transfer software which can help you transfer photos, contacts, videos, music and more other files from iPhone to pc, and vice versa. With this iOS file transfer software, you can also transfer data between any two iOS devices. 2. 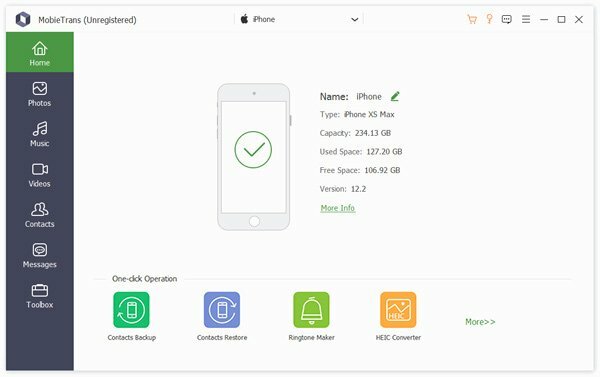 Manage iPhone files What's more, you can also use the MobieTrans to edit or manage your iPhone files such as delete the unwanted data, rename your photos/contacts/music and merge duplicate contacts, etc. 3. Other features This software also provide some small but useful features. For example, you can use it to make your own m4r iPhone ringtone. Then you can transfer the ringtone to your iPhone with simple step. Besides, you can preview before transferring. If your photo's format is HEIC, don't worry about it, our software could convert this format to JPG/JPEG/PNG so that you can view them on any portable devices without any limitation.